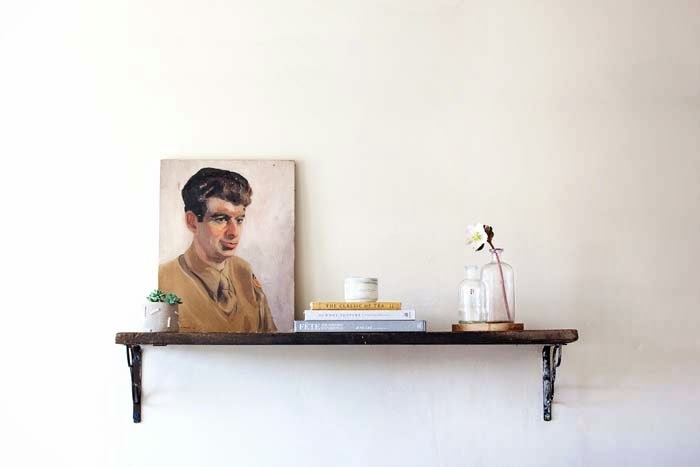 When furnishing a room, we find that one of the more difficult pieces to source is shelving. 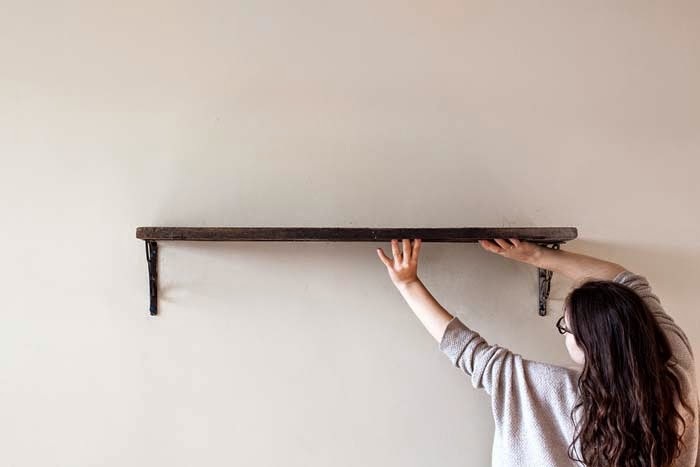 We had always admired wall shelves, but it wasn't until our friends at Meadowsweet Mercantile sourced the most amazing pair of vintage-style brackets that we knew what we had to make! As naive DIYers, we thought we could simply drill our brackets to the wall and be good to go. How wrong could we be: at first attempt, we drilled our bracket to the wall after spinning the screws and it immediately pulled out of the wall--disaster! After some research and a lot of trial and error, we finally figured out the key to hanging a sturdy shelf: having the correct screws for your specific wall! Here's what we learned. 1. First, determine what materials your walls are made of. Each wall has one of two supporting structures--either a stud structure (wood or steel) or a masonry structure (brick or concrete) covered by some kind of surface material (drywall or plaster). Most houses built or renovated after 1950 have walls with stud (wood) supporting structures and drywall exteriors. However if you have an older home like ours, you might have a masonry supporting structure (brick) with a plaster surface. To test, what type of wall you have, turn off power, unscrew light switch over, and look at material behind switch. If it looks like plaster sandwiched between two paper materials, then you have drywall. If not, then you most likely have plaster. Alternatively, you can drill a hole in an inconspicuous part of the wall--this is how we found out that we had brick supporting structure because brick colored dust came out of the wall after drilling through a layer of powdery white dust (plaster). 2. 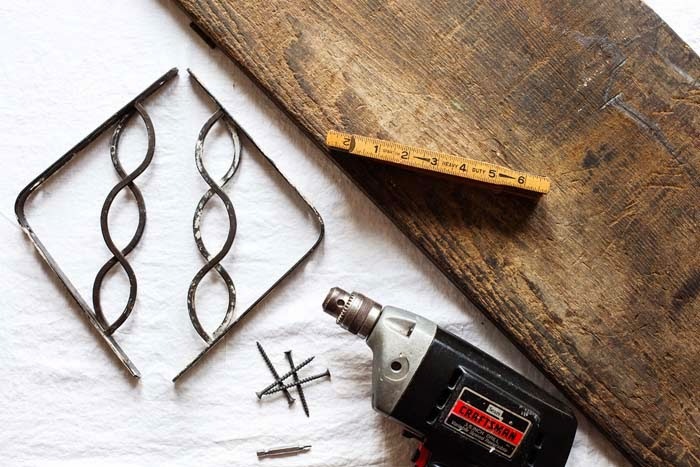 Once you have determined your supporting structure and surface material, it's time to purchase the correct screws for your specific wall type. 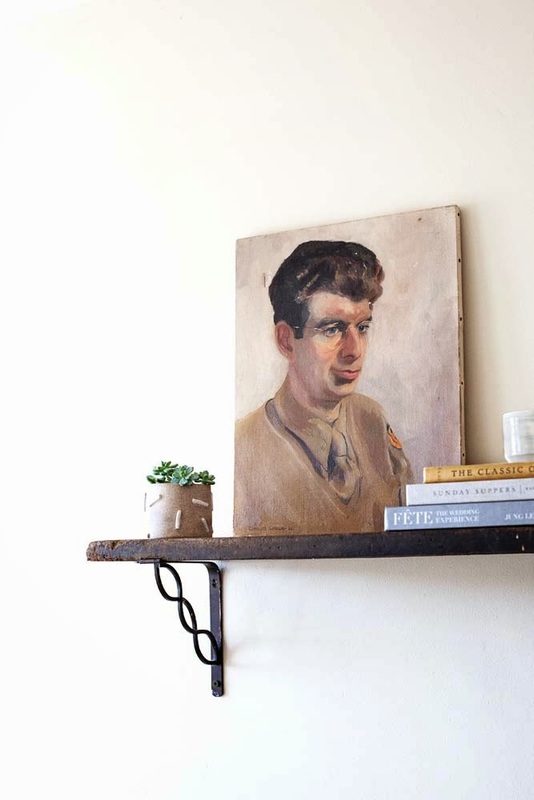 If you plan on putting heavy items on a shelf such as books, toggle bolts are a great option for drywall--you don't even need to find a stud to use them. To install toggle bolts, use a bit that's as wide as the toggle when folded and drill a hole into wall. 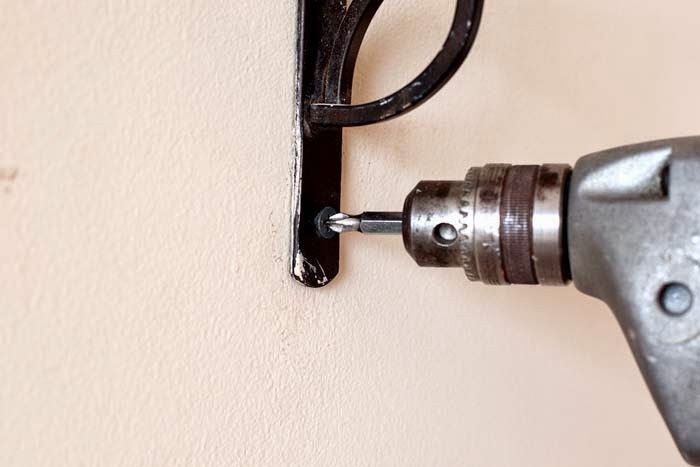 The wings of the toggle bolt will spring open behind the wall once inserted into the hole and from there, you just have to finish drilling it into the wall. Alternatively, if you have concrete or brick supporting structure, you might consider using a masonry screw, which is made to drill through concrete or brick. Masonry screws drill in just like regular screws--these ultimately worked for us! 3. Now you have gathered your materials, measure your walls. 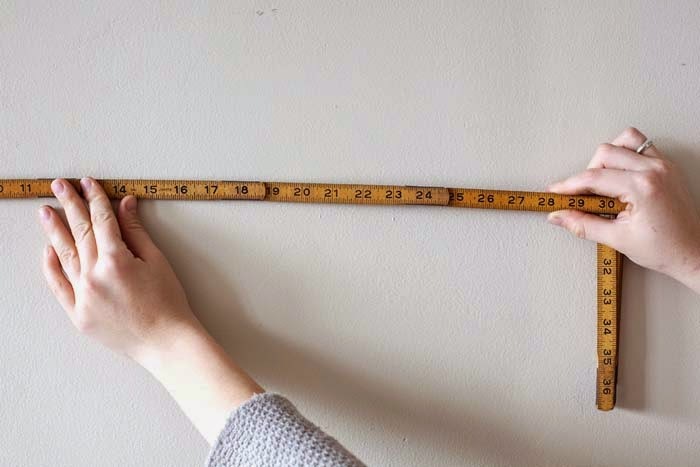 For instance, we wanted our shelf in the center of our entire wall so we measured the wall, then dived number by two to get the center point. We then physically lined up the center of shelf with center point of wall. This showed us where to mark where the brackets would go since the brackets would be flush to the left and right sides of our wood slab. 2. Once you have measured, mark where your brackets are going to go with pencil. 3. Hold first bracket up against wall and position screw in bottom bracket hole first. 4. Position screw into bracket hole and drill into the wall, working slowly until screw is firmly rooted into wall, then move to top hole. 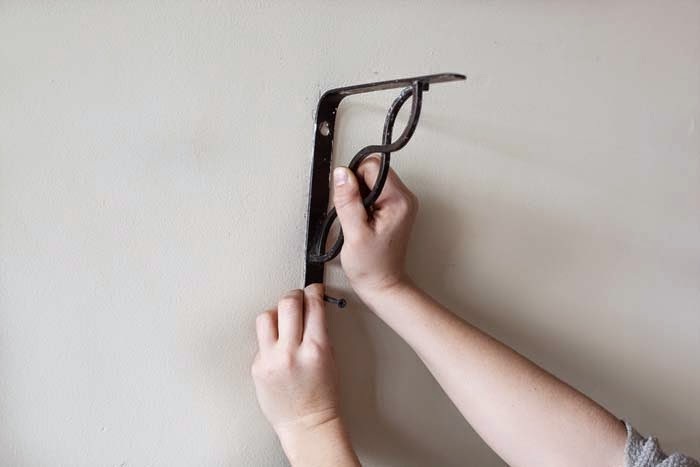 Repeat with other bracket, making sure the brackets align evenly in a horizontal line to avoid crooked shelves. Use a level to make sure they are. 5. Top with wooden board and make sure it's secure before styling.